Grover Cleveland Alexander. Note: Love the old Phillies warm up cardigans. With the trade deadline coming up (and the Phils hopefully selling), I thought we’d look at a few terrible trades in team history. I’ve already covered a few, but I’m gonna cover a couple more and then make a list of the worst five trades in Phils history. It’s just incredible how many times the Phils have been raked over the coals by the Cubs. There was the infamous Ryne Sandberg trade, there was the awful Ferguson Jenkins trade, and just as awful as those two was when the Phillies traded away one of the greatest pitchers in MLB history to the Cubbies for a man named Pickles and a few bucks. 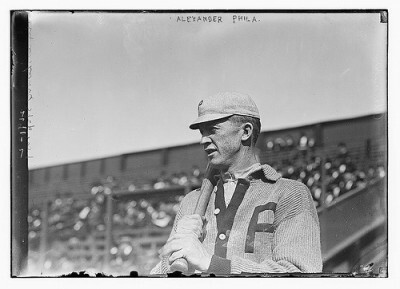 In 1915, Alexander established himself as a pitcher on the same level as Walter Johnson. His season is almost incomprehensible to the modern fan. He went an amazing 31-10 with an unbelievable 1.22 ERA. The next year he went 33-12 with a 1.55 ERA. In 1917, he went 30-13 with a 1.83 ERA. An incredible run of seasons, and Alexander had established himself as one of the greatest players in the game. So what did the Phils do? They traded him (and his highly regarded batterymate “Reindeer” Bill Killifer) for practically nothing. They had their reasons. The US had just been dragged into World War I, and the Phils assumed Alexander would be drafted, so they traded him to the Cubs for Pickles Dillhoefer, Mike Prendergrast, and $55,000. Alexander did indeed get drafted by the Army, and fought on the front lines. The horrifying experience left him deaf in his left ear, injured his arm, left him with epilepsy, and caused him to drink heavily. Even so, he dominated for two years with the Cubs after the war, and remained a decent pitcher into the 1920s. However, his drinking became a major issue, and in 1925 the Cubs sent him off to the Cardinals. He was a World Series hero for the Cards in 1926, and had a few more decent seasons before hanging them up in 1930. He would win a total of 183 games after leaving the Phillies. As for Pickles and Prendegrast? They were non-entities. Pickles would play a total of 8 games for the Phils, batting .091. Prendegrast would last just over a season, going 13-15, with a 3.20 ERA. And even worse than the trade itself, it kicked off an era in futility that has never been matched in pro sports, and probably never will be again. After finishing in 2nd place in 1917, they slipped to 6th place in 1918 without Alexander. They would fall to last place in 1919. It was a position they would get comfortable with…they finished last or next to last in 24 of the next 27 seasons. They finished over .500 in one of those 27 seasons. The Grover Cleveland trade started a freefall which continued downhill for the next generation. Pickles Dillhoefer wouldn’t be around to see the downfall his trade to the Phillies hastened. He died of typhoid in 1922. RELATED: The Urgent Telegram That May Have Cost the Phillies a Dynasty. I LOVE PHILIES HISTORY! I HAVE BEE A PHILLIES FAN FOR 54 YEARS!